Nearly all of us are guilty of distracted driving from time to time. In fact, we recently reported that a surprising 70 percent of motorists use their smartphones while on the road. We take our eyes off the street with regularity, without really pondering the margin for error or what’s really at stake. A new smartphone application by Edmunds is designed to address that sobering fact. 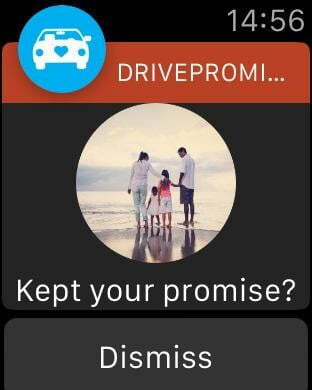 Called ‘DrivePromise by Edmunds,’ the free iPhone and Apple Watch app challenges motorists to stay safe behind the wheel. Before setting off, app users choose a contact and make a promise that they will not text, multitask, or otherwise take their focus off the road ahead of them. DrivePromise then senses when the vehicle is in motion and reminds the operator of their pledge with a photo of said loved one on the Apple Watch. While the app does not detect distracted driving itself, users can keep track of their kept promises and share them with friends and family. Note that the app uses a motion-tracking sensor that’s only available on the iPhone 5S and above. DrivePromise was conceived after Edmunds sat down with Duke University behavioral economist Dan Ariely, who theorized that parents drive more carefully when reminded of their children due to the emotive nature of the maternal/paternal response. What do you think about the app? Is it too cheesy, or potentially lifesaving? Could the photos themselves be a distraction, or a useful motivator? Whatever your viewpoint is, let us know in the comments.